The first time I made Pandan Bread by blending fresh milk together with pandan leaves, the bread turned out with a cheesy smell. I had to discard the entire loaf as no one would eat it. I guess it was the process and probably too much milk in the recipe. This time, I extracted the pandan juice with water and added a cut down amount of milk after. The bread turned out very nice. Add bread flour in a bowl, pour the boiling water and mix well with spatula or spoon. Cling film and place in the fridge for at least 4 hours or overnight. Take out from the fridge 30 minutes before using to return to room temperature. I made the yudane dough 4 hours before and left it outside instead in the fridge. It works too. Put all ingredients including Yudane dough into the bowl of stand mixer. Using the dough hook, knead until the dough comes together, become elastic and tacky but not sticky. It takes around 15 minutes at medium speed. Let the dough rise in a warm place for 60 minutes or until double in size in a large greased bowl, covered with cling film or kitchen towel. Punch down the dough to release the air. 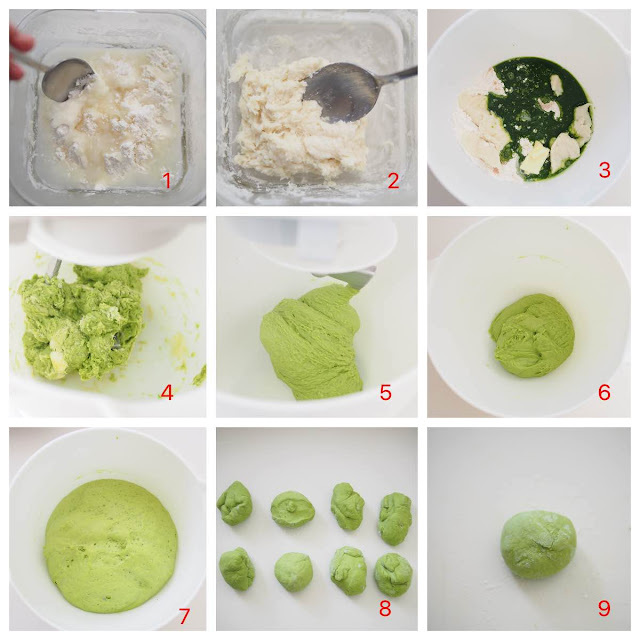 Transfer the dough to a clean floured surface then divide into 8 equal portions. Form each portion to a ball. Roll out each dough with a rolling pin into long rectangle shape. 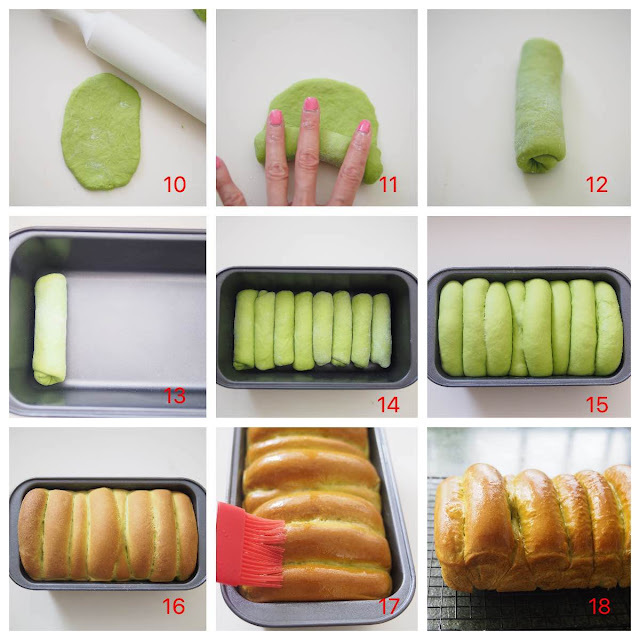 Roll up the dough like Swiss Roll until a small log is formed. 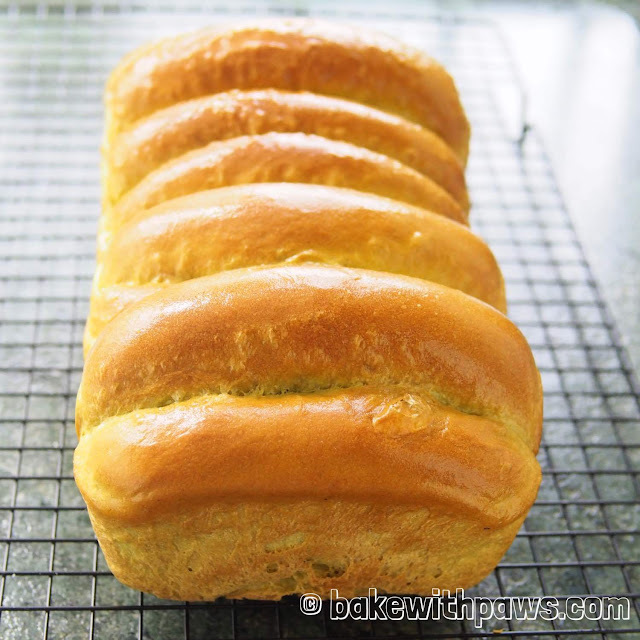 Place all dough in the prepared loaf pan. Let it rise for another 45 to 60 minutes or until double in size. 15 minutes before baking, preheat the oven to 190C. Remove bread from oven and let them cool on rack completely. Will it stay soft after a few days of baking? My bread sometimes turn out to be hard on the very next day of baking. Thank you for asking. 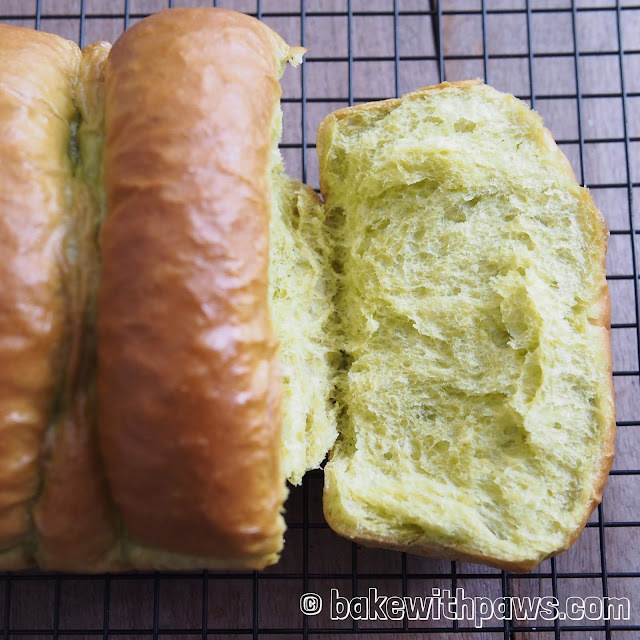 Yudane method bread will stay fresh longer. On the 3rd day it is still soft. But, of course not as soft as 1st day.